The introduction of Palace on Wheels train by Rajasthan Tourism and Development Corporation (RTDC) marked the beginning of luxury train travelling in India. The resounding success of Palace on Wheels inspired other state tourism departments to follow the footsteps of RTDC and led to the introduction of royal rail journeys in south western region of India. The Golden Chariot, south India's first and only luxury train is the prolific outcome of the MOU signed between Karnataka State Tourism and Development Corporation (KSTDC) and Ministry of Indian Railways in 2002. 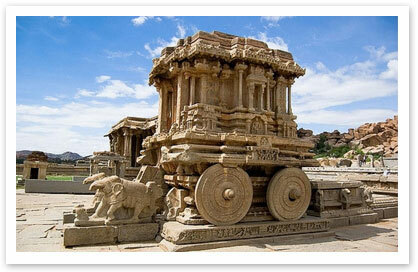 This luxury train in India is named after the famous stone chariot at Hampi. The creators of Palace on Wheels and Deccan Odyssey, Integral Factory Coach (ICF) were given the task to give shape to this dream vision of KSTDC. It took almost 900 layouts by the engineers to finalize the design of the first luxury train of South India. There is no substitute for hard work and that was well apparent in the creation of these coaches. For almost four months, the architect Kusum Pendse along with 200 skilled carpenters relentlessly worked hard for executing the intricate designs of the railway coaches. 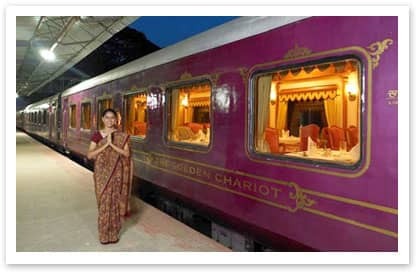 Two months prior to the launch of the Golden Chariot, the color and logo of this much anticipated luxury train was unveiled. The final outcome was unveiled on the tracks on 23rd January, 2008. The train was veneered with classic colors of purple and gold and its logo is a mythological animal portrayed as elephant headed lion. Both purple and gold were chosen owing to their respective significance. While deep purple symbolizes elegance and refinement, gold color represents the golden jubilee celebrations of the state. A ceremonial presidential flag off was given to Golden Chariot at Yeshwanthpur Railway Station by president Pratibha Devi Singh Patil on 2nd February, 2008. On 10th of March, 2008, Golden Chariot chugged on its maiden voyage from Bangalore to Goa weaving through various historically significant and culturally potent destinations in Karnataka. The Mapple Group, a leading Hotel & Resorts chain in India was given the responsibility of handling hospitality services on board. Golden Chariot ensures lavish stay in 44 cabins including disabled friendly cabin characterized by the tasteful décor, elegant sylvan furnishings and state of the art amenities such as LCD television, central air conditioning, writing desk, Wi-Fi internet and en-suite bathrooms. Each of the 19 coaches of regal train offers window to the erstwhile ruling dynasties of the south and resonates with their architectural ethos. The two weeklong itineraries of Golden Chariot train - Pride of the South and Splendor of the South - takes guests on a whirlwind tour across destinations in Karnataka, Kerala and Tamil Nadu. A journey aboard the Golden Chariot train is certainly a five star experience on rolling wheels which lets you treasure troves of south in an opulent and elegant manner.